Lets understand the scenario. An Organization wishes to implement Office365. Since the access of SharePoint and Exchange is possible using a browser , one fear is that if the user password is cracked , then the unauthorized user will have access to the Company Data . This issue can be minimized by using Multi factor authentication or Office 365 MFA . Office 365 offers an elegant implementation of the same. We can enable the Multi factor Authentication or Office 365 MFA for a select number of users . So when these users login , they will be prompted to add second level of authentication. Office 365 gives 3 ways in such the second level of security can be provided as shown in the snapshot below : a) Mobile phone where the password will be sent as text message to the mobile phone of the user b) Office phone where a call will be placed on the Office land line and the password will be given c) Mobile app for Androids, iPhone or Windows Phone where the user can tap the app and get access . So once the Solution is implemented , even if someone were to hack the user password , yet he would not be able to get access to data as the second level is dependent on the user mobile phone or office phone. This will ensure that no unauthorized access would be possible via browser thereby preventing access to the SharePoint data and Outlook Web Access for Email. But what if the person who knows the password , uses the same to configure Outlook or Skype for Business client on his PC and thereby breaches the data? That possibility can be taken care of by using app passwords. 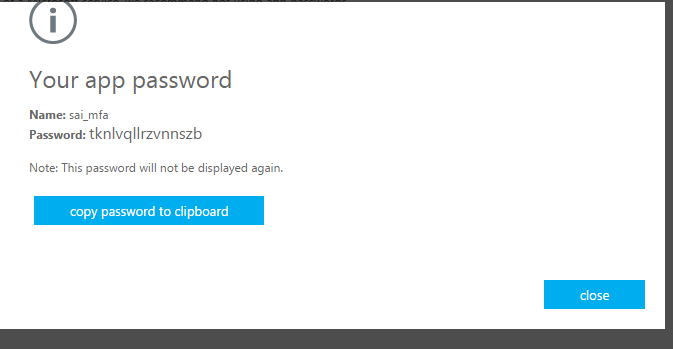 As shown in the snapshot below , the app password can be used with Outlook or Skype for Business Client on the PC. This can also be used with Smart phone apps. Once you enable this feature , a password is generated as shown below which can be copied into a safe place . This password can be entered into the Outlook or Skype for Business Client of the Smartphone app making it more secure. So what we have seen is that the Multi factor Authentication Solution which is available in Office 365 MFA , will make the Service more secure thereby minimizing the chances of a data breach taking place.